Trusted By Lawyers, Accountants and Medical Firms for Over A Decade! Neighborhood Parcel will perform regular service and/or a one-time purge at a specific location agreed upon by both parties in accordance with the terms and conditions of this Agreement. Both parties will mutually establish a schedule or one time purge with Neighborhood Parcel. Both parties will mutually agree to a service charge prior to the service being conducted. Neighborhood Parcel will securely collect all confidential material from the Client location. The confidential material will be shredded offsite or will be securely transported to a Neighborhood Parcel facility for destruction. The material will be transported in locked security containers / Vehicle. All material will be shredded to comply with Federal and State regulations. We will produce a certificate of destruction upon completion of the service. 1.2 Obligation of Client to Neighborhood Parcel. Locked containers are to be used by Client for the sole purpose of keeping confidential documents and are not to be removed or used for any other purpose. If locked containers are lost or destroyed by Client, Client shall pay for all damages or loss of such containers. The locked containers furnished by Neighborhood Parcel hereunder shall remain the property of Neighborhood Parcel and Client shall not acquire any property interest in such containers. We shall be responsible for all damages resulting from Neighborhood Parcel’s handling of the containers. The replacement cost of a damaged or lost container is one hundred dollars per unit. Client will adhere, whenever possible, to the mutually agreed upon scheduled date(s), established for material removal and destruction. Neighborhood Parcel needs a 24 hour advance notice to keep from incurring a financial expense given Neighborhood Parcel’s time sensitive document destruction obligations. Without a 24 hour advance notice of rescheduling in writing, in an email, from a fax, or from a phone call, Neighborhood Parcel will bill the Client a regular service charge to cover expenses incurred in late adjustments or from being turned away from performing the regularly scheduled service when we arrive at the Client facility. For one time purge services, a fee of $75 would apply. Locations more than one hundred miles from our facility are subject to an additional charge of $100. Client shall not deliver to Neighborhood Parcel any material considered toxic or dangerous or which is regulated under any federal or state law or regulation relating to hazardous materials. In the event of accidental or negligent custodial transfer of hazardous or regulated waste, including bio-hazard, Client agrees to arrange to appropriately, safely, and legally assume custody of such hazardous materials at their expense, and further to indemnify Neighborhood Parcel from any property damage or personal injury resulting from such transfer of material. Client agrees to make Neighborhood Parcel aware in writing and in advance of any instance in which Client has reason to know that documents or materials may be particular targets of robbery or theft, including where such documents are negotiable instruments, such as checks, bearer bonds, or coupons where the total combined value of said instruments will be in excess of $5,000. Neighborhood Parcel will work with Client to minimize risks associated with known instruments. Client must present any claim with respect to any Service in writing to Neighborhood Parcel within a reasonable time and in no case later than three (3) months after the occurrence of the event on which the claim is based. Client shall reimburse Neighborhood Parcel for any expenses reasonably incurred by Neighborhood Parcel (including reasonable legal fees) by reason of Neighborhood Parcel complying with its obligations under this Agreement to destroy such materials in the event of a dispute concerning the destruction of the materials provided by Client to Neighborhood Parcel. It is understood that, from time to time during the term of this Agreement, Client may request Neighborhood Parcel to perform services or provide materials which are not set forth in the Contract Duties but are related to the services encompassed within the Contract Duties (hereinafter “Additional Work”). Neighborhood Parcel hereby agrees to perform such Additional Work so long as prior to the performance of such Additional Work, Client shall authorize in writing the scope of such Additional Work and mutually agreed upon compensation payable to Neighborhood Parcel for the full performance of said Additional Work. Client will pay Neighborhood Parcel for Services rendered in the amount and on the payment terms described in an email, printed sales quote, over the phone, and/or via fax. All invoices are due upon pick up or drop-off unless an agreement is in place for repeat clients. This Services Agreement shall be effective the day Neighborhood Parcel drops of security containers or the day the service is provided, whichever occurs first. The contract shall terminate 30 days after the service was conducted for one time purges. For regular service, the contract does not terminate. The contract is a one year term that automatically renews for one additional year based upon the effective date. The Client can end service without cause or reason with a written 60 day notice prior to the effective date renewal. Neighborhood Parcel will perform the final service at the agreed upon service charge(s) and pick up the containers at the conclusion of the service. If the Client wants to end the service sooner than the annual renewal date, then six regular service charges or ninety days of service would apply whichever is greater. (ii)If Neighborhood Parcel is unable for any reason to perform its obligations pursuant to this Agreement in a safe, lawful and professional manner. Upon termination, Client shall pay all actual expenses and charges up to the date of termination. Neighborhood Parcel will perform the Services as an independent contractor of Client and this Agreement will not be construed to create a partnership, joint venture, or employment relationship between Neighborhood Parcel and Client. Neighborhood Parcel will (a) comply with all federal, state, and local laws, ordinances, regulations and orders with respect to its performance of the Services; (b) maintain an account with the applicable state and local tax agencies; (c) file all reports relating to the Services (including, without limitation, federal, state, and local tax returns and a schedule of expenses with the IRS in connection with Neighborhood Parcel’s federal business tax filings); (d) pay all filing fees and federal, state and local taxes applicable to Neighborhood Parcel’s business as the same shall become due; and (e) pay all amounts required under local, state and federal workers’ compensation acts, disability benefit acts, unemployment insurance acts and other employee benefits acts when due. Neighborhood Parcel shall maintain his/her own books and records with respect to Neighborhood Parcel’s business. Neighborhood Parcel will maintain appropriate insurance policies and market appropriate limits and shall show Client the Certificates of Liability, Business Auto Liability Insurance and Worker’s Compensation Insurance, if requested. Neighborhood Parcel shall not be responsible or liable for the release or loss of any materials deposited in bins, cabinets, and/or totters or otherwise delivered to it for destruction unless the release or loss is due to Neighborhood Parcel’s negligence or willful misconduct. Neighborhood Parcel is responsible for secure destruction at the point the material is given/taken possession by a Neighborhood Parcel employee. Neighborhood Parcel’s maximum liability for any and all claims arising from the confidential destruction services performed hereunder shall not exceed the total of invoices submitted by Neighborhood Parcel over the last six month period. Client warrants that it is the owner, legal custodian or otherwise has the right to deliver for confidential destruction any and all materials Client provides Neighborhood Parcel hereunder. Neighborhood Parcel’s execution, delivery, and performance of this Agreement will not violate any other employment, nondisclosure, confidentiality, consulting or other agreements or commitments to which Neighborhood Parcel is a party or by which may be bound. “Confidential Information” means any information relating to Clients property, business, and affairs. 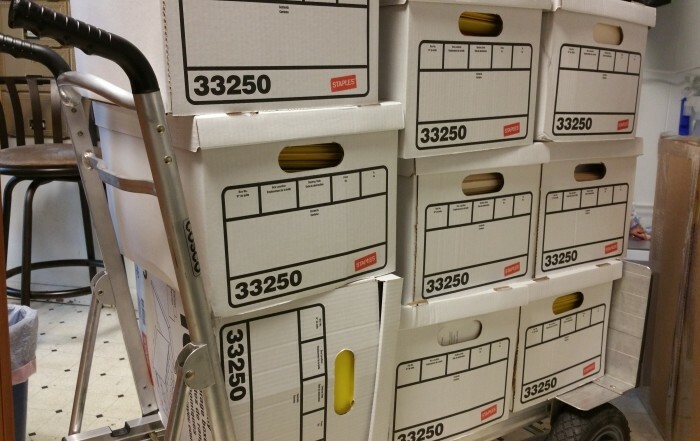 Unless such Confidential Information was previously known to Neighborhood Parcel free of any obligation to keep it confidential, is subsequently made public by Client or by a third party having a legal right to make such disclosure, or was known to Neighborhood Parcel prior to receipt of same from Client, it shall be held in confidence by Neighborhood Parcel and shall be used only for the purposes provided in this Agreement. Neighborhood Parcel shall use the same degree of care to safeguard Client’s Confidential Information as it uses to safeguard its own. However, Neighborhood Parcel will comply with any subpoena or similar order related to materials delivered to Neighborhood Parcel; provided that it shall, unless prohibited by law, notify Client promptly of any such subpoena or notice. It is not Neighborhood Parcel’s responsibility to determine if material should be or should not be shredded. It’s the Clients responsibility to determine which material should be destroyed. Neighborhood Parcel will securely destroy all material given to us without determining its content or value. Neighborhood Parcel will indemnify, defend and hold Client (and Client’s agents and employees) harmless from all claims, damages, losses and expenses (including attorneys’ fees) arising out of or resulting from any claim, action, or other proceeding (including any proceeding by any employees, agents or contractors) that is based upon (a) Neighborhood Parcel’s breach of this agreement, (b) the conduct of Neighborhood Parcel’s business, or (c) any negligent act or omission of Neighborhood Parcel. Client will indemnify and defend and hold Neighborhood Parcel (and Neighborhood Parcel’s agents and employees) harmless from all claims, damages, losses and expenses (including attorneys’ fees) arising out of or resulting from any claim, action, or other proceeding (including any proceeding by any employees, agents or contractors) that is based upon (a) Client’s breach of this agreement, (b) the conduct of Client’s business, or (c) any negligent act or omission of Client. This Agreement will be governed in all respects by, and construed and enforced in accordance with, the laws of the State where the service took place, without regard to any rules governing conflicts of laws. This Agreement constitutes the entire agreement between the parties with respect to the subject matter described herein and all prior or contemporaneous oral or written communications, understandings, or agreements between Neighborhood Parcel and Client with respect to such subject matters are hereby superseded in their entireties. 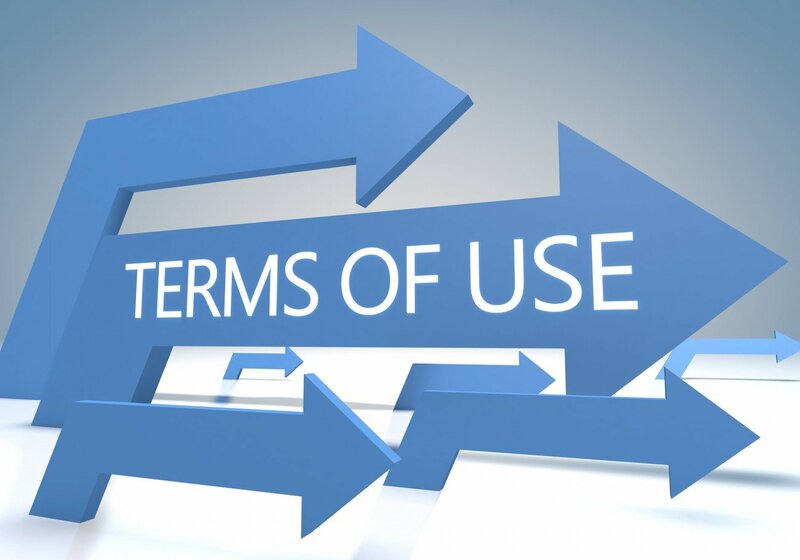 In the event of any inconsistency between the terms of the main body of the Agreement and Exhibit A, then the terms of the main body of this Agreement shall take precedence over the terms of Exhibit A. Any changes, amendments, or modifications to this Agreement and/or Exhibit A shall not be binding on the parties unless mutually agreed to by the parties in writing. If any such changes, amendments, or modifications cause an increase or decrease in the cost or time required to perform the Services, mutually agreed adjustments shall be made in the contract price and/or the period of service described. If any provision of this Agreement is held invalid, illegal or unenforceable in any jurisdiction, for any reason, then, to the fullest extent permitted by law (a) all other provisions hereof will remain in full force and effect in such jurisdiction and will be liberally construed in order to carry out the intent of the parties hereto as nearly as may be possible, (b) such invalidity, illegality, or un-enforceability will not affect the validity, legality, or enforceability of any other provision hereof, and (c) any court or arbitrator having jurisdiction there over will have the power to reform such provision to the extent necessary for such provision to be enforceable under applicable law. Both parties agree that in the event of a conflict that a reasonable effort will be made to resolve the conflict in a timely and reasonable manner mutually agreeable and beneficial for both parties. It is understood that reasonable effort would require, at a minimum, a face to face meeting. In the event a conflict cannot be resolved, the parties agree to submit the matter to binding Arbitration, pursuant to the procedural rules of the American Arbitration Association. Each party shall be excused from any delay or failure in performance under this Agreement for any period if and to the extent that such delay or failure is caused by acts of God, governmental actions, labor unrest, riots, unusual traffic delays, natural disasters, or other causes beyond its control. 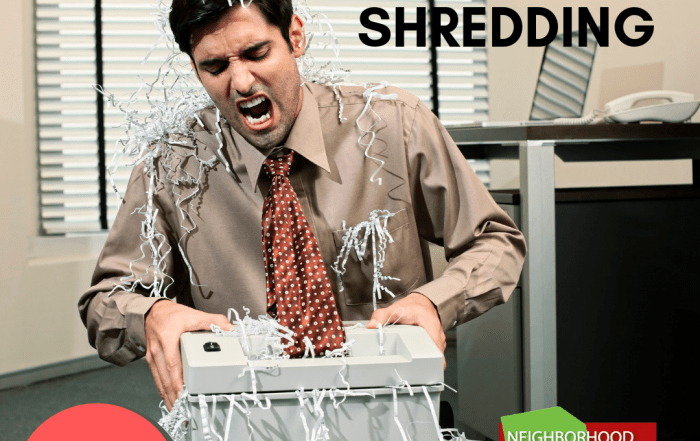 Book your next shredding service here and save! 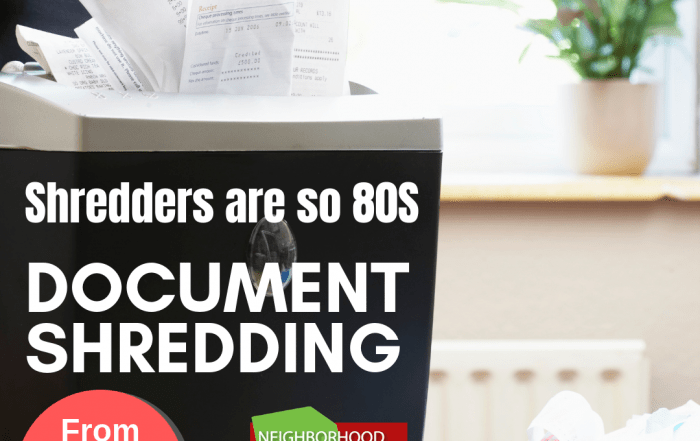 How Can I Shred Medical Records?